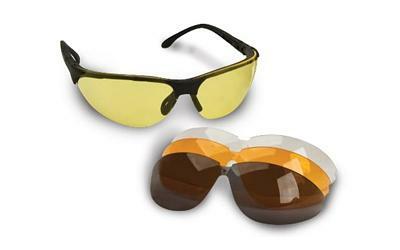 Walkers All-sport Glasses | On-Target Indoor Shooting Range, LLC. High grade Polycarbonate lenses. Exceeds ANSI 287.1-2003 High Impact Requirement. 99% UVA/UVB protection. 4 interchangeable lenses. Ratcheting lens pitch adjustment. Design allows air to flow freely. Adjustable nose pad.